The Tamron 28-300mm f3.5-6.3 Di VC PZD is a high-power, all-in-one zoom lens with splashproof construction for full-frame DSLRs. 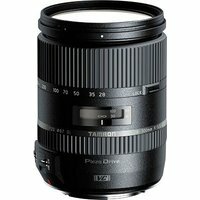 This lens delivers superb image quality in a remarkably compact, lightweight package, and is the fruit of Tamron's program of extensive technological development over the years. Perfect for travel, this lens incorporates Tamron's PZD (Piezo Drive), a standing-wave ultrasonic motor system optimised for swift, quiet autofocus, along with the acclaimed VC (Vibration Compensation) mechanism plus a new cosmetic design and finish.